Our NEW Color Library Multi-Purpose collection introduces two new books, both filled with gorgeous patterns and decadent color. Onyx-Carob-Ivory serves as a companion to Onyx and Carob in Color Library Upholstery: Nomadic Color. The warm and bold neutrals exude a refined modern style with nomadic spirit with its fringe, batik-inspired prints and patchwork designs. With Moss-Cement-Denim, we celebrate the effortless warm tones that tie Enchanting Color and Nomadic Color together. The soft hue of Enchanting Color’s Moss coordinates naturally with Nomadic Color’s Cement, a mid-tone ash, and Denim, a stonewashed indigo blue. Patterns incorporate rug patterns and organic geometrics found in traditional wall hangings, kilim rugs and ceramic ware created by nomadic tribes around the world. These books make an exciting foray into exuberant pattern, energizing color and a fresh new design point of view for 2016. 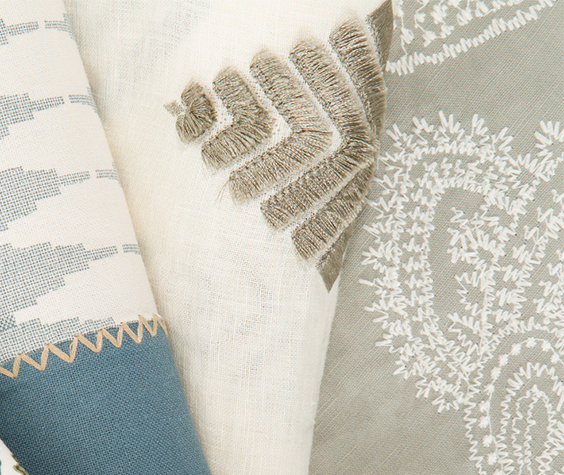 The fabrics feature globally-inspired motifs with archival and artisanal origins. They include large-scale medallions, graphic paisleys and playful ikats, and come in fantastic constructions such as embroideries, prints and multi-purpose wovens. Patterns and colors in this collection are meant to be layered. They also dovetail nicely with Robert Allen Color Library upholstery collections, as well as the Drenched and Landscape Color lines..
Multi-Purpose Color Library Books featuring prints, wovens and embroideries in a meticulously edited selection of small and mid-scale patterns in colors that coordinate with existing upholstery books. Water-Cobalt-Spring Grass offers fresh, livable color, Chocolate-Lemongrass-Peony provides invigorating contrast, and Glacier-Pewter-Driftwood contains earthier tones. Soft shades of blue and green form the foundation of this soothing color book inspired by water. While Dew, from the Color Library Filtered Color 2014 collection, brings more green into the palette, Fountain and Sea are two new hues that round out the offering with their subtle shades of light turquoise and pale blue. Varying shades of gray infused with pops of yellow meld soothing tones with high-energy accents in this color book. Zinc, a light gray from Color Library Filtered Color 2014, and Chalkboard, a dark gray from Color Library 2013, serve as perfect counterpoints to the golden yellow of the newly introduced Citrine. Feminine with an edge, this color book is both fresh and high-fashion. The blue undertones of Iris, originally part of the Color Library Filtered Color 2014 collection, complement the bright, yellow-green of Chartreuse (from Robert Allen@Home’s Rain color story) and the warm reddish purple of Wisteria.